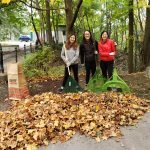 Into the Streets: Volunteering was Unbe-leaf-able! 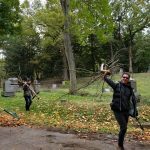 Earlier last month, some of our team members headed over to Ithaca City Cemetery to volunteer as part of Into the Streets, which is Cornell University’s largest day of service! 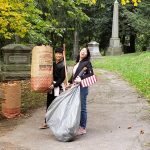 We collaborated with Historic Ithaca to help clean up the cemetery in preparation for the 4th annual mile run through the cemetery the following day. 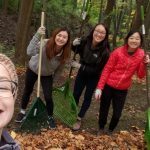 We helped by raking up leaves, replacing damages flags, picking up trash, and even cutting down branches that were in the way! 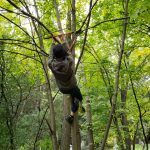 One of our own, Nathan, insisted on climbing some trees to cut down some large branches, and Vivian got stuck in a leaf bag! 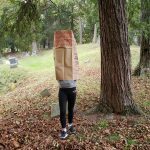 Some of the boys observed various insects, and we even played in a pile of leaves! It was a great chance for some team bonding and we are very thankful to have had this opportunity to work with our community and help make it a better place! We look forward to other volunteering events in the future!